To round off our 2016 season we where hired by discovery for a 2017 release of the latest “Serial killer” instalment. Concluding the ongoing story, we hosted the network for 3 days at the island making for a fantastic finale to our 2016 Guadalupe season. Teaming up once more with Producer Jeff Kurr and TV presenter Brandon McMillan as well as working alongside Cameraman Andy Casagrande we set sail one last time for the year. 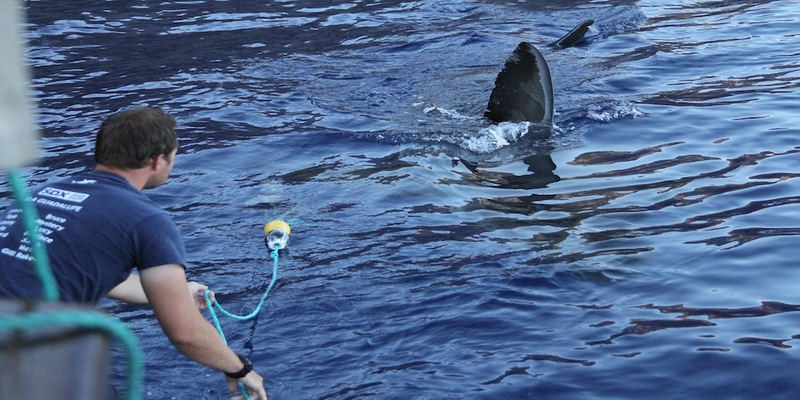 Without giving away plot details, the aim this time was to film segments interacting with White sharks and getting Brandon face to face with the animals once more. At this time of the season we had the island all to ourselves as all the other operators have finished their season by this point. However…..what seemed like a straight forward shoot turned out to be far from easy…….. The aim was to film one or more of the shows big sequences today. These where the two most important scenes so we wanted to get them “in the can” as early as possible. We got off to a great start, the shark action steadily built throughout the morning and by lunch time we had successfully shot one of these scenes. For the second scene it was critical that we get the “right shark” to work with but although the action stayed solid, the opportunity didn’t present itself to us for the remainder of the day. Still, an excellent start and we looked forward to another great day ahead…or so we thought…..
Up early and keeping our fingers crossed that the sharks would be back on their game, our team and the producers tirelessly began to work the sharks from first light. Although we had a few sharks around it looked worryingly like they where in the same non active mood as yesterday, however around mid morning they seemed to to begin to “warm up” and by lunchtime where back playing as we know they can! We managed to pull off a very exciting sequence during this time and soon after this we got another scene while the action was so good! This concluded our mission and ecstatic (and highly relieved!) we pulled anchor for the last time of the year and began our final voyage back to San Diego. After the whole team put such an effort in to this production there is no better feeling than knowing you achieved what we came to accomplish and we cant wait to see the final cut come shark week 2017! Stay tuned and keep watching!